Brick gables, picture windows, and a center front dormer combine with desirable amenities and flexible bonus space to create the perfect home for the modern family. 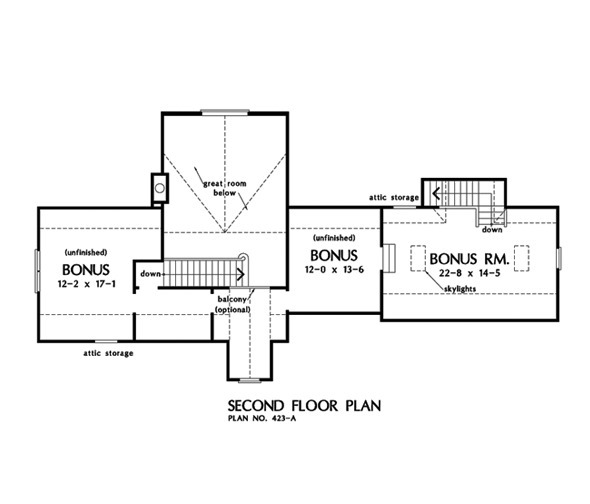 A vaulted ceiling enlarges the great room, while interior columns in the adjoining kitchen/breakfast area and tray ceilings in the study/living room and dining room provide further interest. The private master suite includes a skylit bath with garden tub, separate toilet, and double bowl vanity. Two additional bedrooms, located on the opposite side of the house, share a large full bath and linen closet. The generous second floor bonus space provides room for future growth. 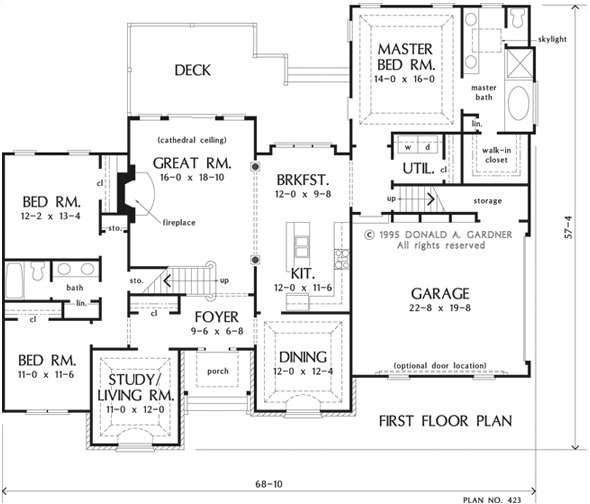 1st Floor: 2170 Sq. Ft.
Other Storage: 615 Sq. 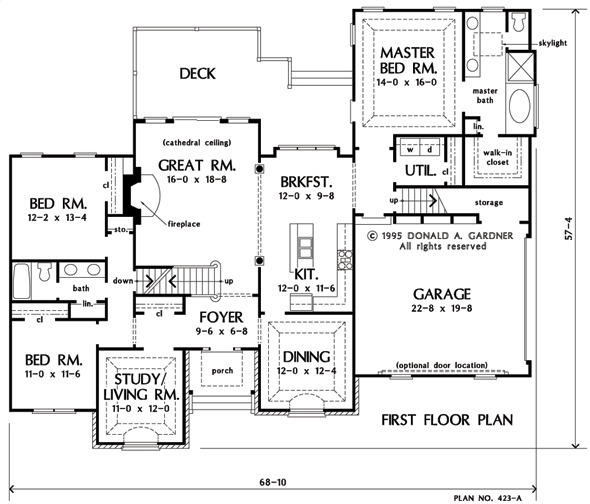 Ft.
House Dimensions: 68' 10" x 57' 4"
Great Room: 16' 0" x 18' 10"
Utility Room : 6' 4" x 6' 4" x 8' 0"
Bonus Room : 22' 8" x 14' 5" x 8' 0"
Garage : 22' 8" x 19' 8" x 0' 0"
Garage Storage : 13' 4" x 3' 4" x 0' 0"
Master Bedroom (Tray): 14' 0" x 16' 0" x 9' 6"
Bedroom #2 : 11' 0" x 11' 6" x 8' 0"
Bedroom #3 : 12' 2" x 13' 4" x 8' 0"
Porch - Front : 9' 6" x 6' 0" x 0' 0"
Deck / Patio : 28' 9" x 12' 0" x 0' 0"
Living Room (Tray): 11' 0" x 12' 0" x 9' 6"
Storage (Other) : 3' 4" x 1' 11" x 8' 0"
Storage (1st Fl.) (Sloped): 7' 0" x 3' 0" x 0' 0"
Foyer : 9' 6" x 6' 8" x 8' 0"
Dining Room (Tray): 12' 0" x 12' 4" x 9' 6"
Great Room (Cathedral): 16' 0" x 18' 10" x 17' 0"
Kitchen : 12' 0" x 11' 6" x 8' 0"
Breakfast Room : 12' 0" x 9' 8" x 8' 0"